Cooking up artistically delicious family-friendly dishes from my Kudos Kitchen to yours! 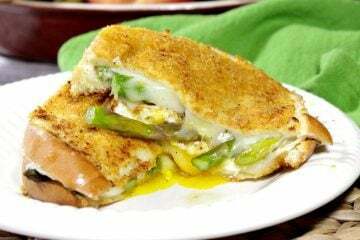 You’re going to LOVE this Mouthwatering Grilled Cheese Breakfast Sandwich with Provolone & Asparagus for breakfast, lunch, OR dinner. Seriously, if I had my way, I’d be happy to eat it this baby for all three meals in the very same day! Then, maybe I’d turn around and do it all again the next day, too. What can I say? It’s that good!! I haven’t shared a breakfast pizza recipe in quite a few years, so I thought it was time to come up with something new. 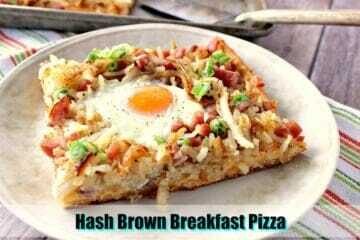 The last one I shared, I called Easy Breakfast Pizza, and it dates back to 2011. This new recipe I call Sunny Side Up Hash Brown Breakfast Pizza uses pop-tube crescent rolls, frozen shredded hash browns, American cheese slices, eggs, diced ham, and chopped scallions for garnish. If you’re used to making pancakes from a box (trust me, I don’t judge), put the box away this one time and make these Apple Cider Pancakes from scratch. You’ll notice the difference, and they won’t take hardly any more time or effort to make. This recipe for Corned Beef Hash Frittata is super easy to make because it takes advantage of frozen hash brown potatoes and deli counter corned beef. Once it assembled all you need to do is pop it in the oven in the same skillet you cooked the potatoes in, and then go about your business until the eggs are cooked through, nicely browned, and the house smells amazing! Poppy, Sesame Seed Challah = The Best Egg Sandwich EVER!